Well, I've been so busy posting about what you can do with your produce I haven't been posting about how ours is coming along. I'm going to make up for it, yes indeed. You thought there was a momma of a canning post last week, well, today I present a momma of a garden photo post. 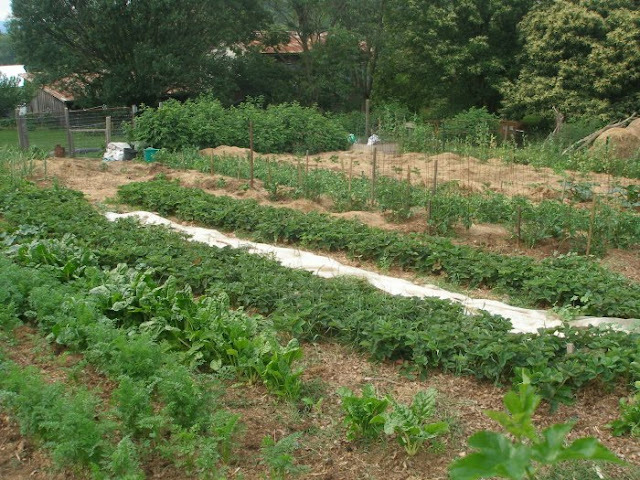 Below is our main (fenced in) garden. 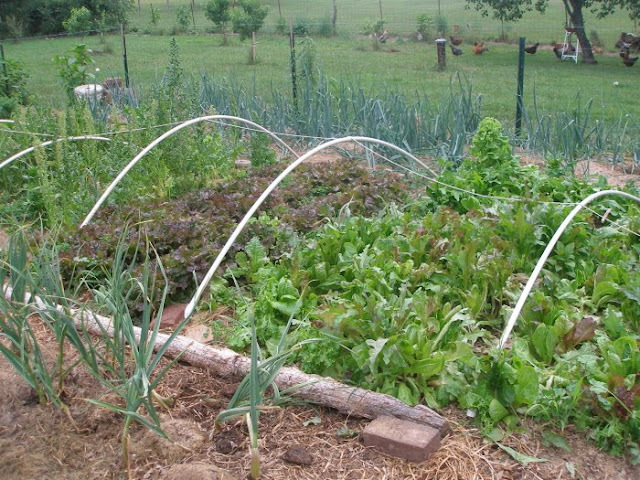 Above is our lettuce and spinach. Much of it has gone to seed, but we have been adding plantings and covering the poles with sheets to give the younger lettuces shade. Because of this, and making sure to pick it young, we still have salad to eat. Garlic is on the left, onions on the right. 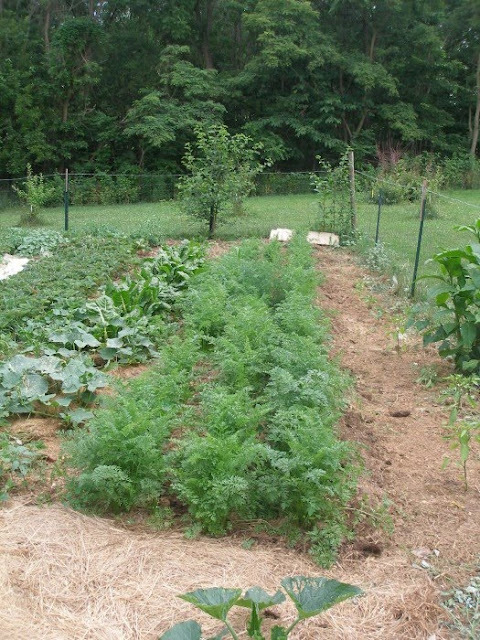 From right to left, a row of jalapeno peppers, carrots, and Swiss chard. 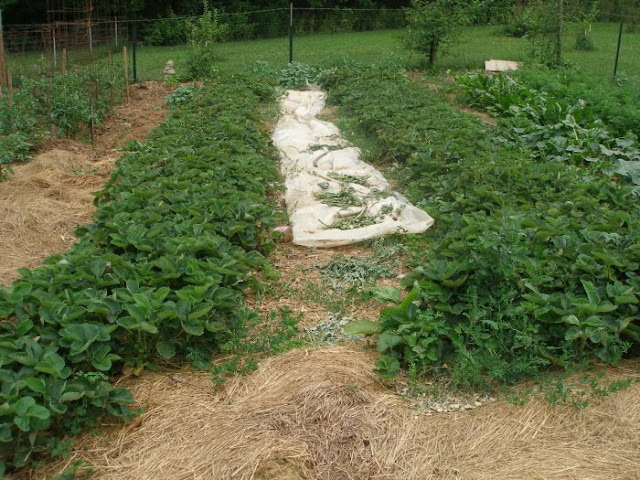 On either side of the plastic (left there from long ago when we had to occasionally cover plants due to frost) is our strawberry beds. These plants were the original ones (or the children of the originals) that we planted here 5 years ago. This year's crop wasn't that great- both in quantity and quality, so we've bought new plants and have started a new strawberry bed for next year (see down the page bit). Bell peppers part way back right side, tomatoes line the rest of both rows. To the right are the peas we planted en masse as an experiment. Things were going along swimmingly until we went away for a weekend. While we were gone, there were either strong winds or the weight of the pods caused the plants to lean all the way over. They look pretty pathetic, but the peas are still good. Next year we will be trying bush peas. To the left and toward the front are two half rows of stevia. 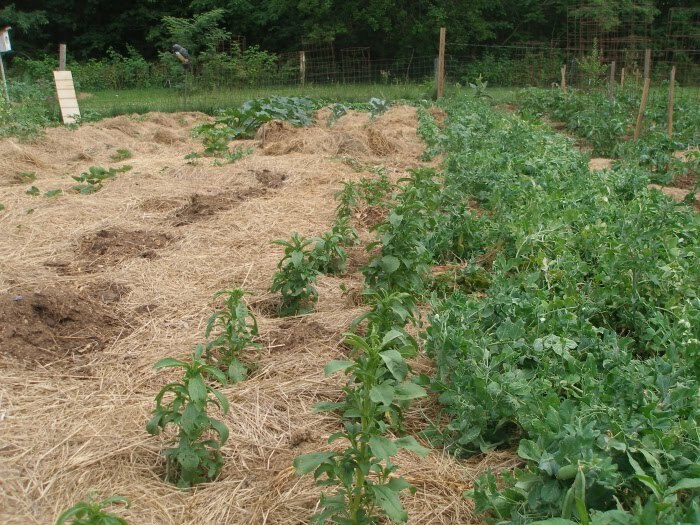 Behind the stevia and beside the peas is a half row of basil. 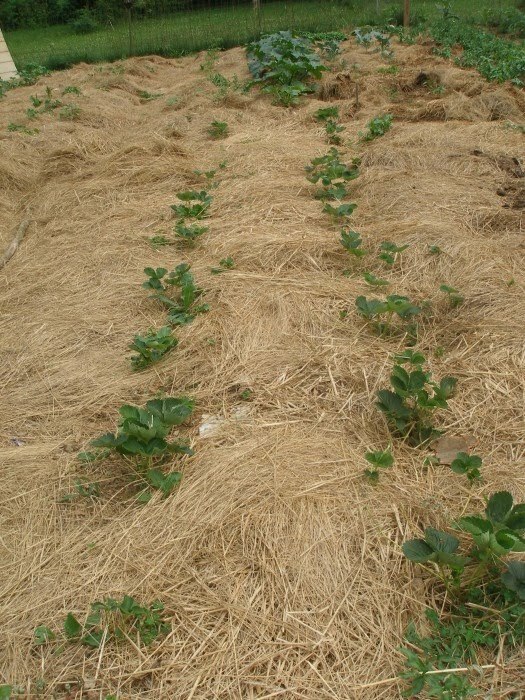 In front are the new strawberry plants that will become our new strawberry bed. 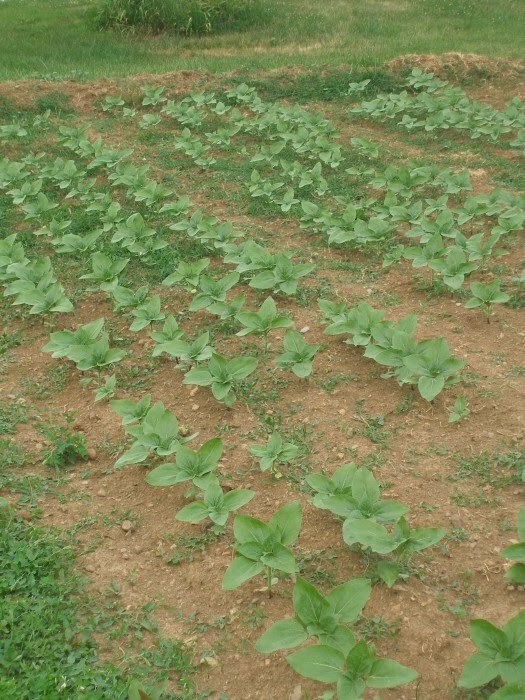 There doesn't look like there are many plants there now, but these plants are already sending our runners that we will transplant behind these plants, hopefully extending the rows (eventually- after the plants behind them are done) all the way to the fence. Behind the strawberry plants are 5 zucchini plants and the broccoli. To the right are our sweet potato hills and the little slips that are taking root. 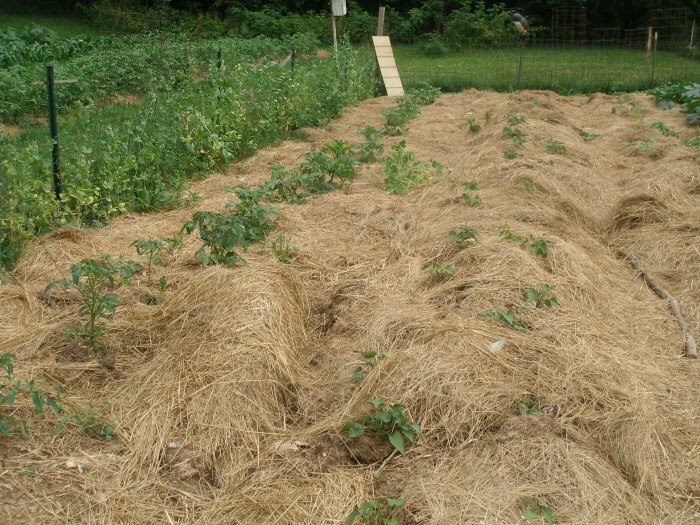 Before long, you won't even be able to see the straw- the sweet potato vines will cover everything. 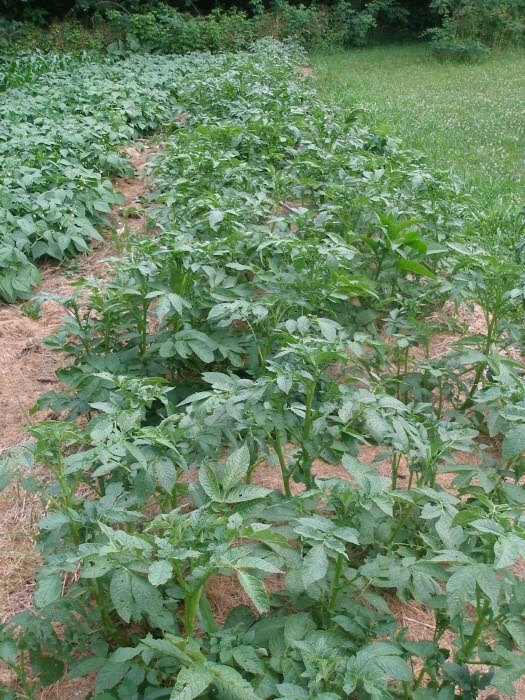 To the left, another row of tomatoes. To the left of those, snow peas along the fence. 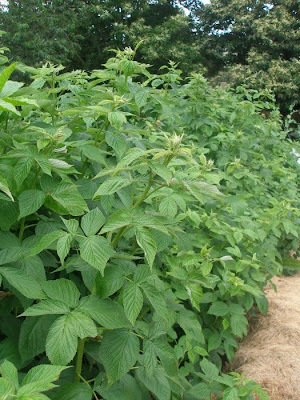 These guys don't really belong in the garden, but the red raspberries we planted outside the garden fence thought being inside the garden would be lovely. We don't really mind. We love raspberries. I ate the first ripe one a few nights ago. Shhh. Potatoes. Sam is ready for those potato beetles. He's saving up for a lego set and knows we pay per beetle. 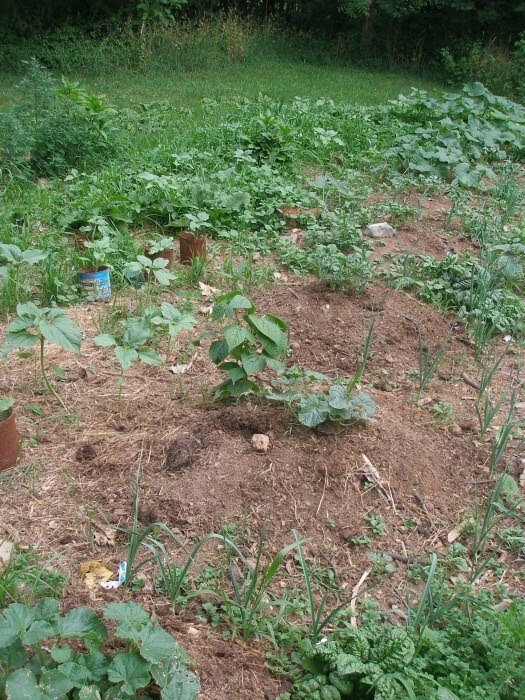 Sunflowers, leeks, cantaloupe, butternut squash, and pumpkins in the back. This section is next on my weeding rotation. 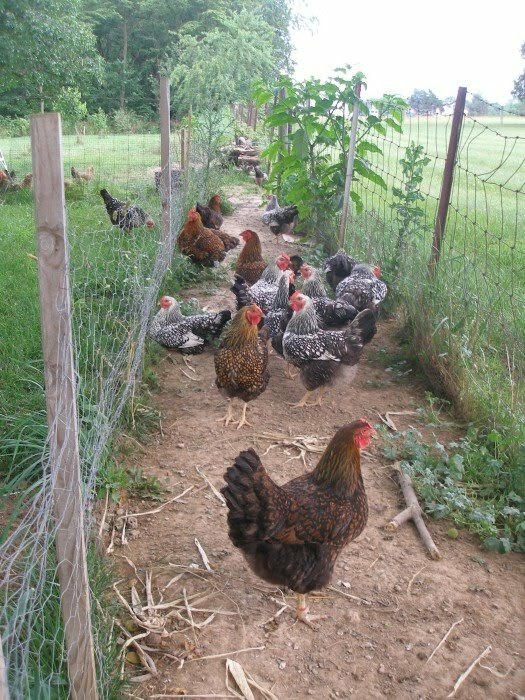 The lovely egg layers in their run that connects their house to their yard. Yes, I know. One had gotten out. Mint bed. Want some? It's free. My brother's sunflower patch beside our house. 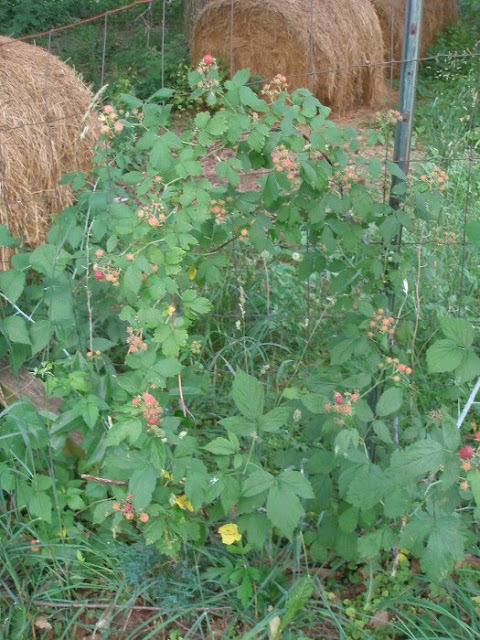 Some of the many wild black raspberries that grow around the property (not yet ripe). Close up of wineberries (you can't see the berries yet- they are inside those little pouches). 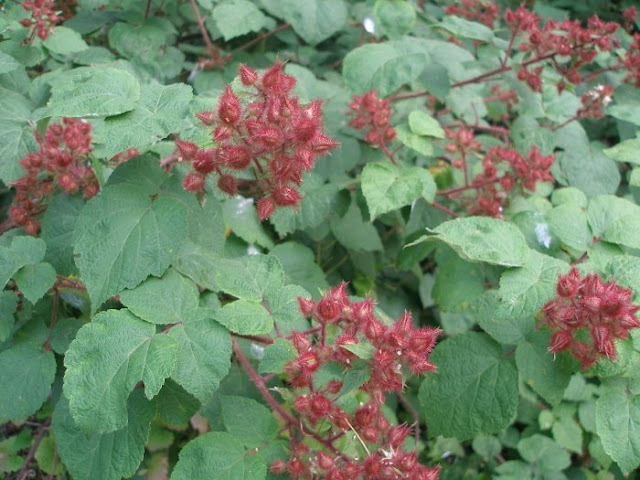 A note about wineberries. They are pretty seedy, so making jelly is tedious. I toss them in with the raspberries and freeze them- they're great in muffins, oatmeal, on or in ice cream, cobblers, etc. There are peaches on our peach trees!! Two or three years ago, we planted two or three year old peach trees (sorry I can't be more specific). This year is the first year we might get fruit. 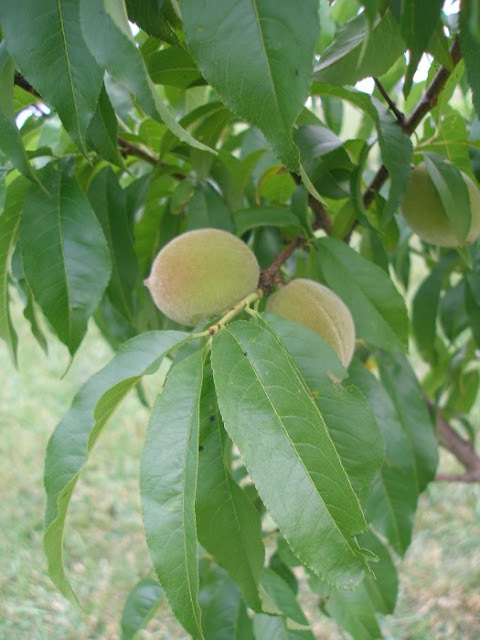 On each of our four trees, there are about 4-5 peaches. At the same time, we planted six apple trees, but they were only a year old at the time, so they're still tiny. There you have it- our garden in June. 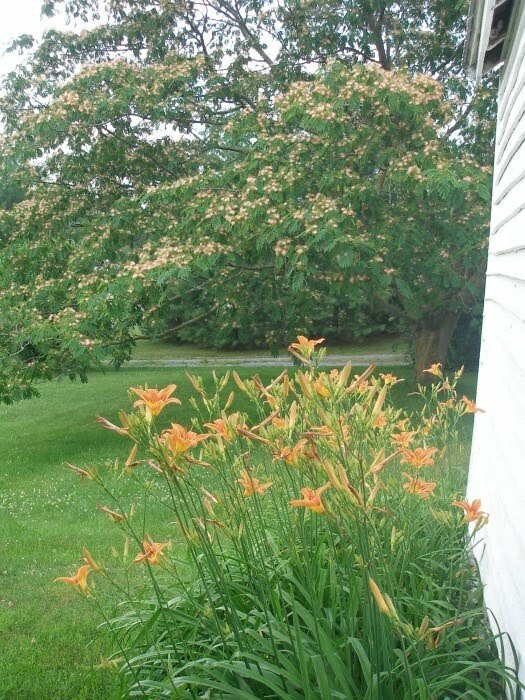 I'll leave you with a picture of day lilies beside the smoke house with the blooming Mimosa tree in the background. Isn't this time of year lovely? By the way, I'm realizing that you really can't talk about gardening without talking about weeds, so keep your eyes peeled for a weed post coming up soon. Wineberries make the best crumb pies. After making the pie cover it with a cloth and allow it to 'ripen' for at least two days. I know it's hard but the flavor improves immensely. Looks wonderful! I think it looks like you mulch with grass clippings? Right? Were do you buy your strawberry's and other berry's from? We need to put in about 1 million more but I know if there is an inexpensive way to buy them you have it figured out. Oops. That was supposed to say 'not a weed in sight'. Your garden is beautiful! And, not a week in sight! Is that straw that you put down? I'm thinking that might be something I need to try. I haven't been able to weed my garden in such a long time. I'm curious about how you use the stevia. I have two plants but I'm not sure how to harvest and process the leaves. How do you do yours? I'm impressed! Wow! Thanks for inspiring! Amazing! I'm sure gardening can be a full time just with the size of garden you have!! PS- what do you do to keep your pears pest free? My tree is going crazy with fruit this year and I'd like to eat at least one! Wonderful post thank you. I also have wineberries. Is there anything else you can do with them? Do you feed your family exclusively from your land? I think we'd go broke if we hired Sam to smash our potato bugs...it's terrible out there. Guess I should get myself a can and head on out! WOW!!! 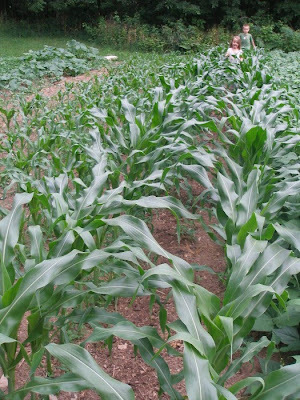 Your garden is HUGE! It looks great and I'm kind of jealous, as I only have a very small space to work with in my community garden plot. Wow! I'm so impressed!! I have 6 pots with tomatoes and peppers that I'm trying to keep alive, and a few other veggies here and there too! Are your pears Keifer? We have a Bartlett and a Keifer and I get so fed up with the Keifers--how do you use them? Monday blessings to you, Love seeing the garden and all your harvest! What a lot of work-oh my, but I know your family is blessed by the work of your hands. 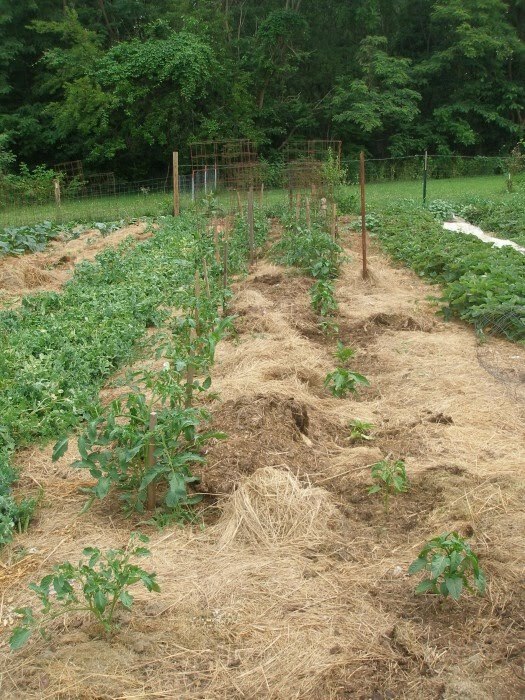 Karen and Brookie, We use mostly straw, but also grass clippings and mulched leaves as mulch on our garden. 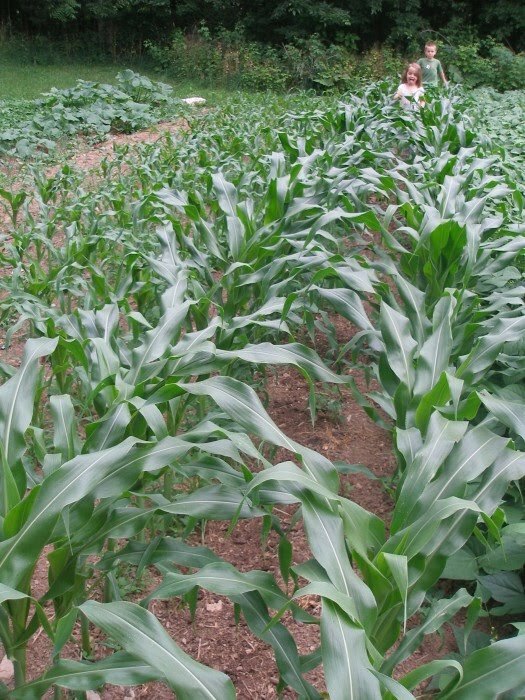 If layered thick enough, it cuts down on weeds and helps hold in moisture. Brookie, We get our strawberry plants locally- at the garden center. We also don't buy as many as we want (to save money). We let them spread and then transplant the baby plants where we want them. We got our red raspberry bushes from friends- new growth canes transplant beautifully. The black raspberries and wineberries were here:-). Tidy Brown Hen, This is the first year we're growing stevia. We plan to use the leaves in mint tea (as sweetener), but beyond that, we're still working on what we'll do with it. I'll keep you posted:-). Sarah A.T.J. and Monica, We think this is a keifer pear tree. It was here when we moved in. We had six other huge ones that produced (in my opinion) worthless pears so we chopped them down. 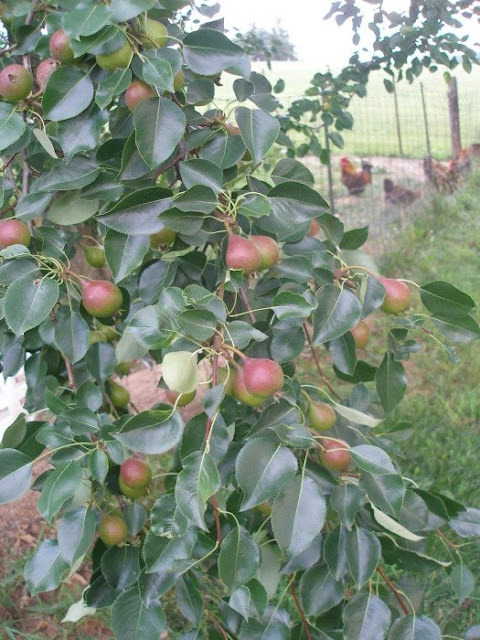 This tree is smaller and may be a cross or a similar variety because they are much more edible. I have canned them in the past and, other than being small, they turned out great. We don't do anything to the tree (spray wise). 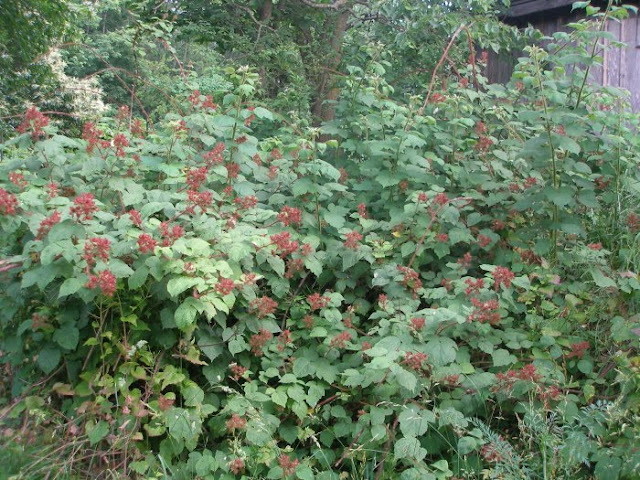 Lilly Zoo, We eat the wineberries fresh or freeze them to throw into baked goods. You can make jam (if you remove some seeds) and Aunt V commented above that they make lovely pies. I loved seeing your garden. Beautiful! 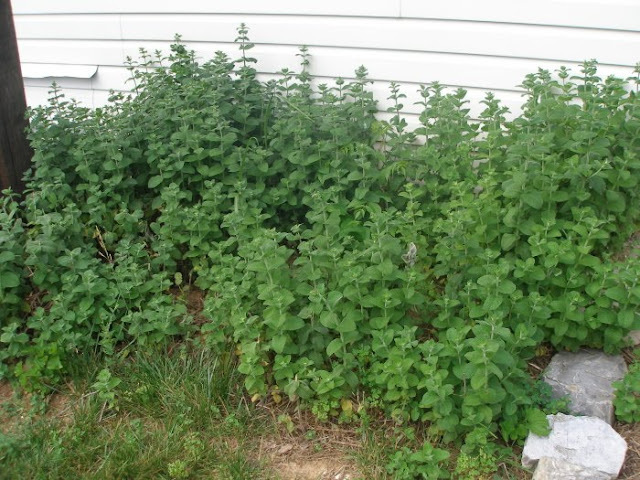 We have a lot of mint too! Do you ever make mint jelly? My kids love it! I really need to figure out what more to make with the mint we have - any ideas? I hope you don't mind that I linked your blog on my post yesterday. I just wanted to share your great blog with those who read mine! wow - so much fresh food to eat. I never thought of making mint jelly! What's wrong with me?? I might have to give that a try. Did you know you can make mint tea concentrate and freeze it? I don't have a recipe, but maybe someone here does or you could do a search online. Ha! You're absolutely right. It does get overwhelming. What helps is having a plan, so that when each vegetable comes rolling in I know whether I'm going to can, freeze or dry it. And anything (which, thankfully, isn't much) that we can't deal with goes to the chickens before it goes bad:-). Speaking of time, how on earth do you find the time for all of this? Your gardens are looking incredible, I'm so very impressed. 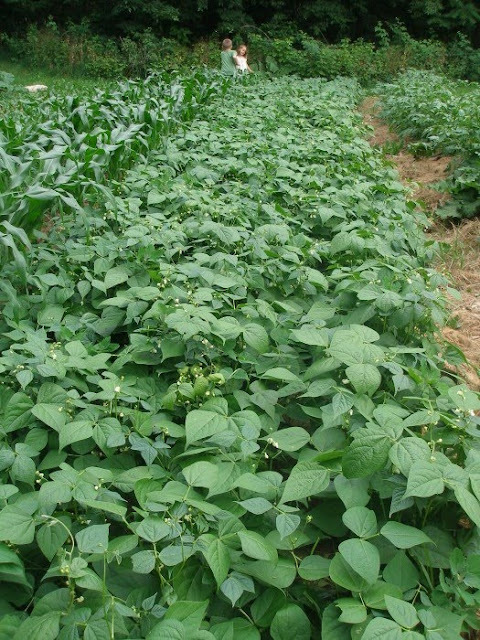 What a fantastic harvest you are going to end up with this season...just look at all those green beans. We started growing afilia bush peas last year and love them. Our tall vined peas always get blown over by the wind but the afila peas are low and attach to any small fence or support with a death grip. Question. I have some heirloom spinich I left go to seed so I can save some, but I'm not sure how to go about it. Do you save your seed? When & how would I go about doing it? Thanks so much! Time certainly is a valuable commodity around here. Trying to get everything done is a constant challenge:-). THHPP, I've been so busy, I haven't even had time to read blogs. I've missed all the wonderful posts you've been writing (but missing blogging friends especially!). You're garden is wonderful! I'm having a mix of great successes and absolute failures this year in my garden, but it's all good - we learn by our mistakes! It's a shame that the strawberries are on the decline. Is there nothing that will revive them for a few more seasons? I'm clueless on the subject, but I should get some good lessons from my friend who has an organic farm this summer. She's hired me to pick raspberries and ollaliberries for her starting in July! I would almost do it for free just to learn from her! Many blessings for an abundant harvest! You can also dehydrate your mint leaves and use the dried to make tea later. thank you for sharing about your faith & all those recipes... i hope it's not rude to ask "do you sell part of your harvest to support yourself or just freeze everything or give some to needy people. Jeanette and Greg, Thank you! 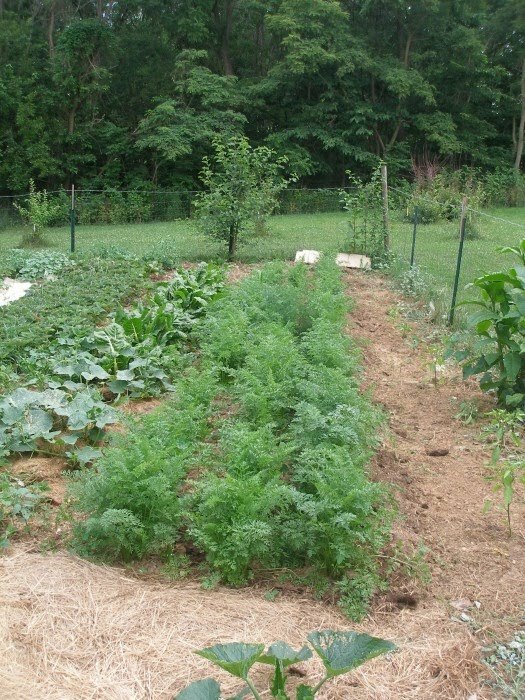 We use almost all of what we grow to feed ourselves. If/when we have an abundance of something, we share it with friends and family and occasionally, take some surplus to a local food pantry. 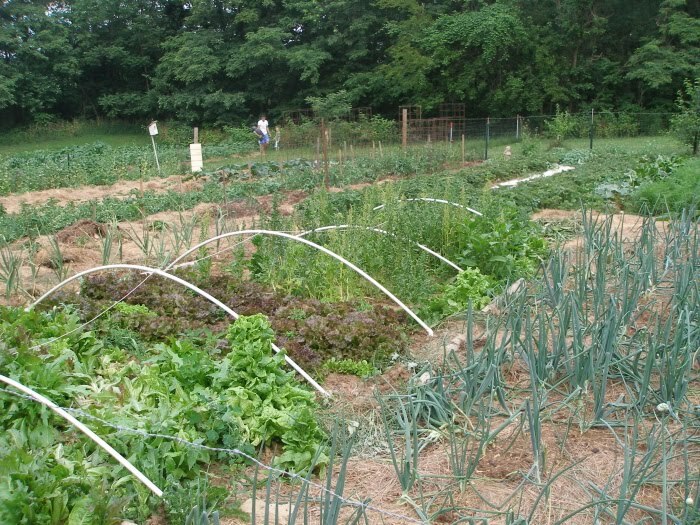 We just moved here to a 4 acre farm and I am loving your gardeing 101 posts! I have a question about your peach trees-ours had fruit on them when we moved in (August '10), but they had black spots on them- not deep spots, but I am wondering what to spray them with as far as fertilizer- or what to do to take care of them so we an eat the fruit. I am planning on pruning them back in the next week or two. I'm so glad our gardening posts are helpful to you! Unfortunately, we are not very knowledgeable about when can ail fruit trees. Our peaches only just started producing this past year and we don't spray them. I would suggest searching online for possible causes of the black spots and fertilizer choices. Best of luck to you and thank you for introducing yourself:-). So much interesting reading and beautiful gardens! 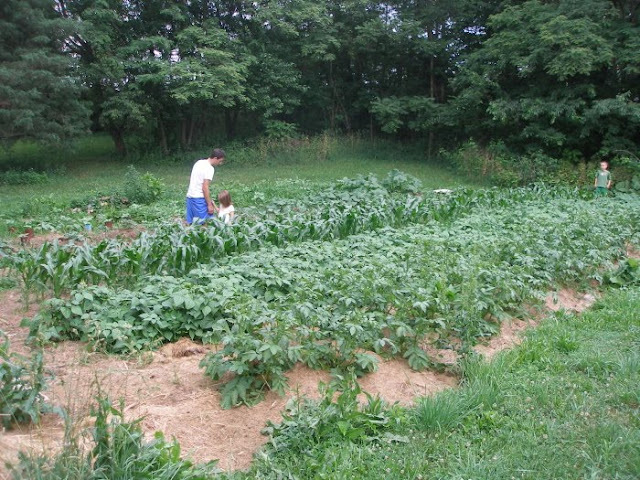 I am still learning, but one thing we learned about growing potatoes is that the beetles go after the potatoes when they are planted too early. We usually plant around June 1 here in Ohio and no beetles!